The Frigidaire Front Load Washer is an Energy Star certified washing machine with a stainless steel drum and washing capacity of 3.5 cubic feet. One problem that you may face if you own this washing machine is that the filter, located at the drain valve, may get clogged with debris or sediment. If a clog occurs, you'll notice that the water drains into your machine slowly or not at all. With the correct cleaning technique, you can restore the filter to its original state and restore proper water flow into your washing machine. You could have a problem with your home's plumbing system. Turn off the hot and cold water faucets. These are located near the back of the machine, or wherever your machine connects to the water supply. One has a blue handle and the other has a red handle. Pull the washing machine away from the wall. Locate the machine's drain hose. While the actual drain is located inside of the washing machine, the hose is an outer feature. It's a large hose connected to a standpipe on your home's wall to the back of the machine. Don't confuse this hose with the inlet hoses connected to the hot and cold-water valves, which are smaller hoses. Consult your owner's manual if you're unsure which hose is the drain hose. Unscrew the hose where it connects to the wall. Have a small bucket ready and hold the hose so that the end of the hose is facing down toward the bucket. This will allow you to collect any water that drains out of the hose. Wipe away any dirt or debris from the drain filter screen, which is located on the end of the hose. If you see any significant buildup or sediment, then further clean the filter. Fill the bucket with oxygenated bleach or a lime scale remover and allow the end of the drain hose to soak in the bucket for 30 minutes. This removes any significant buildup that may be clogging the drain hose. Reattach the drain hose and turn the water valves back to the "On" position. Run the washing machine again. 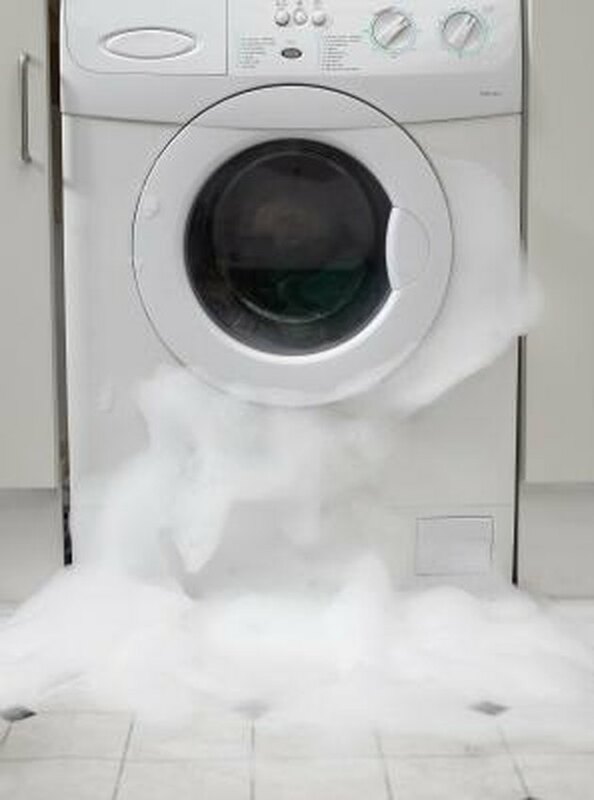 If the water is still not draining, contact a washing machine repair professional or plumber, who may need to check your home's plumbing system or the washing machine's drain, which may be the cause of a draining problem.